I've read up and have been informed that when changing batteries in a Bentley Continental, you need to disconnect the right battery neg terminal first, then the left. Can anybody tell me why you have to do it this way? This procedure must be strictly followed. 1. Switch off ignition and all electrical consumers and remove ignition key. 2. 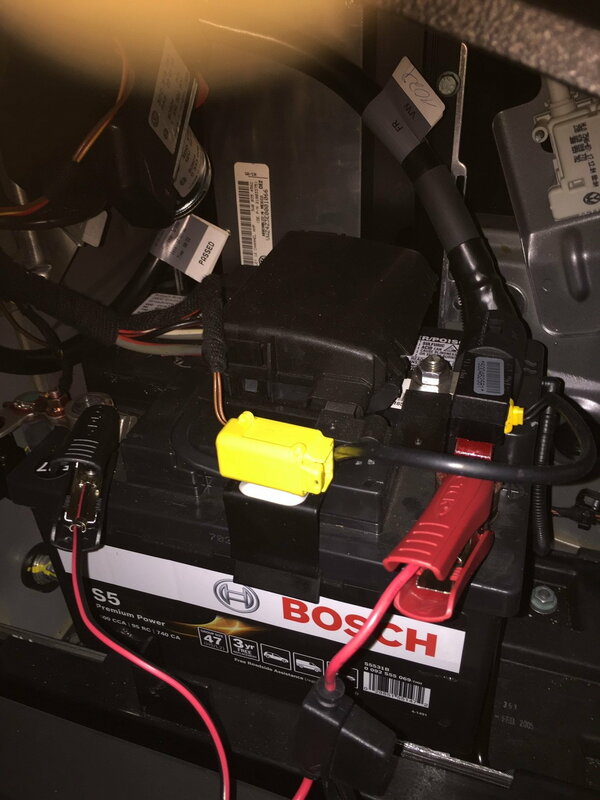 Wait 60 seconds - Disconnect starter battery in luggage compartment on right (see below). 3. Disconnect main system battery in luggage compartment on left (see below). 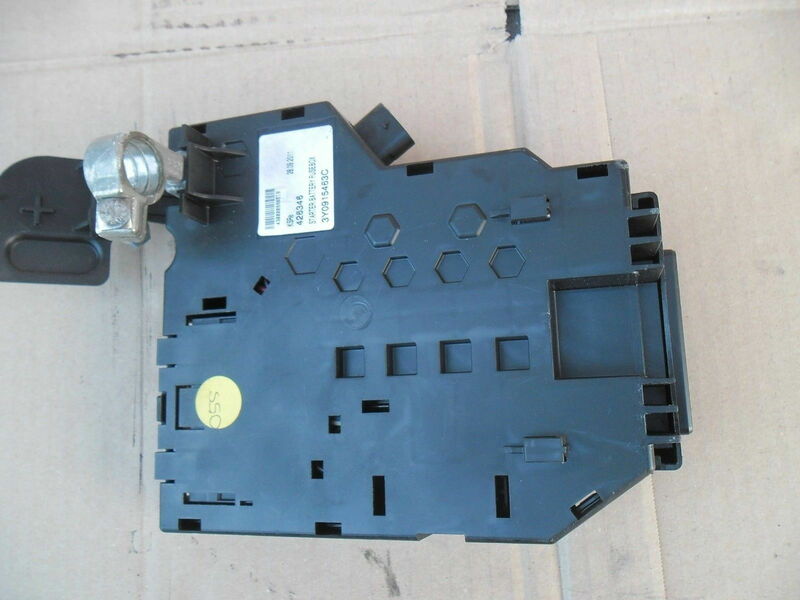 accident, the air bag control module triggers a charge disconnecting the voltage supply wire to the starter. Disconnect battery clamp (1) from battery negative terminal post. Disconnect battery clamp (2) from battery positive terminal post. Disconnect the negative terminal (1) of the starter battery. 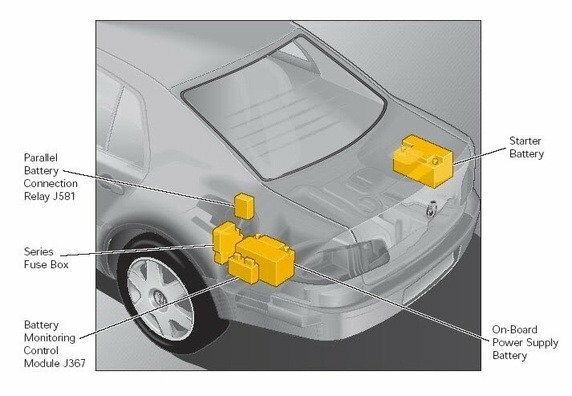 to cause a short circuit or allow the cable to come in contact with the air bag connector (7). Remove the fixing (2) and disconnect the red starter battery fusebox cable (3) from the battery near to the positive terminal. Lift up the plastic cover (4) to access the positive battery terminal, and loosen the clamping nut. Lift off the battery isolation igniter (5) and attached starter cable (6). Disconnect starter battery in luggage compartment on right (see above). Disconnect battery earth lead (1) at battery negative terminal. 1. Connect main system battery in luggage compartment on left. 2. Connect starter battery in luggage compartment on right. damaged. The procedure for connecting batteries must be strictly followed. 2. Fit positive terminal clamp onto battery positive terminal. 3. Only after securing positive terminal clamp, fit negative terminal clamp to negative terminal on battery. Tighten battery positive terminal clamp securing bolt. Battery terminals must not be greased. 1. First switch off ignition and all electrical consumers and remove ignition key. 3. Fit positive terminal clamp onto battery positive terminal and the cable to the starter battery fusebox on Continental GTC cars. 4. Only after securing positive terminal clamp, fit negative terminal clamp to negative terminal on battery. Battery terminal clamps must only be fitted by hand without force, this prevents damage to battery housing. 1. Switch Ignition on and off again with ignition key - Read fault memory. 5b. (4 door cars) Check seat memories have been retained. Reinitialise individual seats as necessary. 7. Check all electrical consumers are functioning correctly. Last edited by Rico.Adams; 04-15-2019 at 04:31 PM. Background - Unfortunately I had a battery drain (now fixed), but prior to fixing the battery drain, I replaced the batteries (a couple of times) and did not follow this procedure. Now my car won't start . . . So I have some follow up questions. So, beyond the isolator, there could be other electrical damage. I MIGHT know what some of that is, but we're ahead of ourselves. 1. Please describe completely what the car is doing? a. What happens when you put the key in the ignition? Does the dash and electronics wake up? 2. Are you completely dead when you try to crank start? If you have electronics on and try to start, does everything go dark, or just no crank? 3. Are other electronics on, but just no crank? Or completely dead in any mode? 6. Describe the batteries you replaced. Is the LS battery an AGM? The isolator IS designed to disconnect the RS battery completely, so if you have live electronics when you insert the key then you at least have a a live LS battery. If you have nothing, then we first have to try to get to the main batt fuses and relays, check those. EDIT: I reread, and looks like you do have power from the LS, but if you can answer any of the other Qs. Last edited by BWings; 04-16-2019 at 05:08 AM. So the car responds completely as normal in every way, all works, when I insert the key the steering lock disengages and all the dash lights come up as per normal. When I go to start the car (turn key) literally nothing changes in any way. It's like i'm not even turning the key. I tried the CCW turn then CW turn, and no changes, all lights are there on dash, but doesn't crank. Just no crank, dash lights all stay on as if there is a hard break between the RHS battery and the starter motor. LHS battery seems to be working fine, all radio, keyless entry, seats, etc. are working fine. Immobilizer is happy, so yeah, silence. Yes I have VCDS, but am holding fire for now, after work today i'm going to do a hardware check, fuses, etc. And see if I find anything first. Then if I do not find a fault there, i'll do a pull from the VCDS reader and see what codes I get. Then do a clear down (as per the Bentley instructions you posted) and try to start again. Literally the opposite. So power drain was on LHS bat, it went flat. So I disconnected that bat only and replaced with new (thought it was the old battery that was at fault). Car was running at this point post replacement. Then battery died again, so I knew it wasn't just and old battery that was the issue. So I changed the bat under warranty and changed again (then put that battery on charge with trickle charger. Car still running at this point. Took car out of garage and parked on drive, (not on charge), battery died in less than 24hours. Bridged batterres to start (via key), then both batteries were dead, smart eh? So couldn't drive to Bentley to fix as dead, so bought 2 new batteries LH & RH. Found and fixed the bat drain and replaced both batteries LHS first (difficult one) then the RHS. Batteries now not draining yay, but car won't crank. So has been sat for a couple of weeks now and batteries still at full health, so have definitely fixed the route cause, but have unknowingly walked into another issue. It was the recommended battery from my local part supplier (Brand: Yuasa), don't quite know what AGM means tbh? I bought the most expensive battery they supplied (for both), so didn't cheap out. Are the main bat fuses under the leaf screen/engine bay? OK, thanks. So you possibly DID blow the pyro device. I'll do a data dump here on what I know. And, before I get there, with a VCDS, do a complete module scan. Look for a fault(s) in address 15 (Air Bags) and or the battery module address 71, but also any faults in addresses - 05, 07, 09, 17, 19. 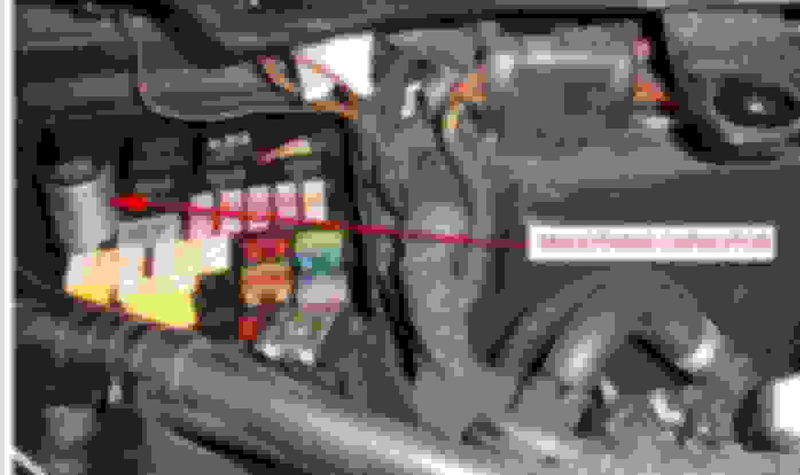 The pyro module is located right off the + post of the starter battery. Here is a pic of mine, then a pic of another VAG pyro module. I don't know wherewhen changes might have been made, but mine is an 05 GT. It is the black box behind the yellow fuse and with a large solid connection terminal directly on the + term. Ignore the battery cables for my batt tender. Here is a generic pic of where the first two items can be located and probably accurate for Bentley. First step, run the VCDS and see where it points you. Hopefully you only have the pyro device gone, or simple a batt main fuse or relay. You should be able to probe and do some simple continuity checks on around the pyro module. If that looks OK then start down the path of any of these other devices. Again, I want to stress, I've not personally diagnosed and fixed a blown Pyro module. I'm operating in theory here, but if you post the faults found in the VCDS dig, I'll try to help you more. Last edited by BWings; 04-16-2019 at 06:07 AM. Ok, i'll run the VCDS first and see what's what, and then go from there. Crazy question, but can I not just bypass the pyro isolator, see if it starts, to check if that is actually the fault? If it is (i.e., engine starts), then i'll order another one. If not, then i'll look elsewhere. I cannot answer that question. Might work, but might not either. It depends how sophisticated the electronics are. Everything with CanBus designed modules is check and crosschecks. So, if a certain circuit has to first send a go signal and you've bypassed it, you might find that something else down the line did not allow the Kessey key to work. Still guessing here. It'll will have some level of risk trying, but it's yours to decide. Gook luck, keep posting please...would like to see you running again.